It took me a long time before I was able to gain enough shoulder and core strength to get into this pose. The first time my teacher demonstrated it I'm pretty sure I rolled my eyes and thought "yeah, right". Well, about two years later Flying Pigeon is one of my all time favorite poses! The key to getting the hang of this pose is knowing how to ease into it and progress one step at a time. I like to break this pose down into 4 key steps. The first two steps focus on hip flexibility and the last two steps focus on core and upper body strength. This pose will help you develop the essential hip mobility required to get into the full expression of the pose. It will also help you work on balance which you'll need once you're on your hands. Start in chair pose and cross your right ankle over the top of your left thigh. Keep your right foot flexed to protect the knee start to bend into your left knee to sink your hips back. Keep your chest lifted and send your breath into your right hip. Repeat on both sides. From your modified chair pose, get even deeper into the hips by slowly leaning forward until your fingertips come down onto the mat. If this is not yet accessible to you, use a block or two or stay in Step 1. The key here is to focus on sending the hips back and the chest forward to really get a great stretch. The advantage here is that you can use your hands for balance and focus on flexibility as opposed to strength. Now to the fun part! Staying as you are with your palms on the ground from step 2, make sure your fingertips are spreading and your hands are shoulder width distance apart. Wrap your right toes around your left bicep. This grabbing action is extremely important and will help prevent your right leg from slipping off of your arms. Start playing with balance by gently rocking back and forth to shift more weight into the palms and maybe lifting your left toes off of the mat. 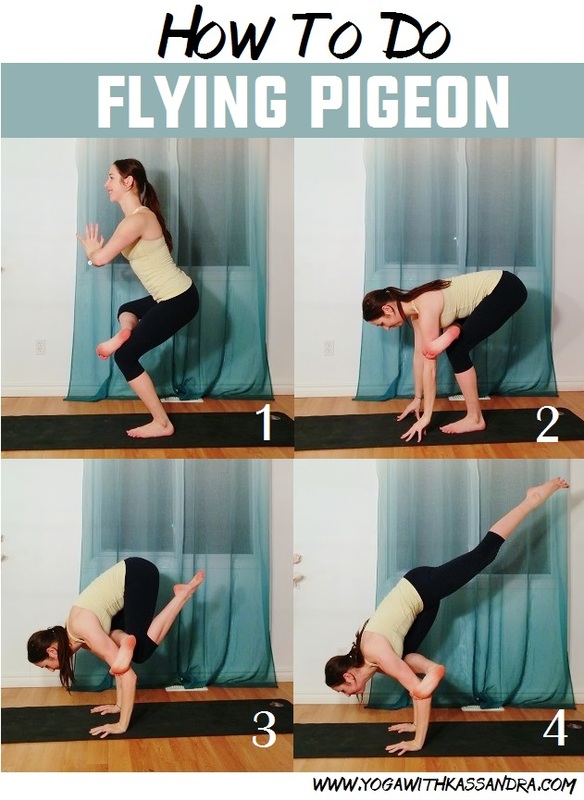 This is a similar core and shoulder engagement that you would have in Crow/Bakasana Pose. If you manage to lift your left toes off of the mat, squeeze that leg in close towards you and remember to breathe. This is it! If you're able to balance on your arms with your back leg tucked in, you can start playing with reaching that leg up and back. The major difference here is that you need to lean your head and chest forward even more in order to counterbalance your leg lifting back, otherwise you won't be able to hold the pose. Spread your toes, reach through your feet and slowly start to straighten your leg as you dip (lightly) your chest forward. You will most likely feel your obliques engage here which is exactly what you want! Try to maintain smooth long breaths and don't let your neck and jaw take on all the tension. This is a fun pose but like all challenging things in life, it takes practice and dedication. Remember not to be too hard on yourself if it doesn't work out and stay positive! A practice is not meant to be perfect. I'd love to hear your flying pigeon stories and please let me know if you have any questions or concerns.